View cart “Radish – Organic Champion” has been added to your cart. (Cucurbita moschata) 95-110 days. The most popular of the winter squashes. The Organic Waltham Butternut Squash was introduced in 1970 by Bob Young of Waltham Massachusetts and is an All-American Selections Award winner. Buff colored rind with fine-textured, sweet orange flesh, that is creamy and rich, with a nutty flavor. Stores very well, lasting sometimes 6 months or even longer. Very resistant to vine borers. Vigorous and dependable. Fruits average 8-9″ long, and weigh 3-6 lbs. Organic Waltham Butternut is great for steaming, boiling, baking, or even harvest young and use as a summer squash. 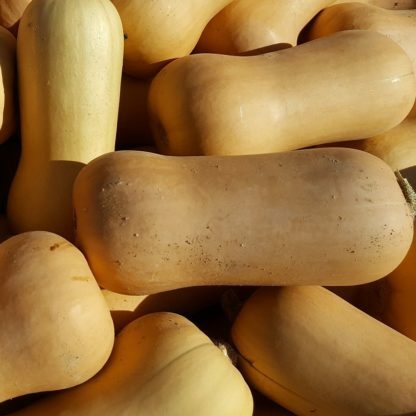 Organic Waltham Butternut Winter Squash is a warm season crop, sensitive to frost and light freezes. Start Organic Heirloom / Open Pollinated Winter Squash indoors 3-4 weeks. before last frost date or direct seed outdoors after danger of frost. Plant Organic Winter Squash in full sun. To direct seed, plant 6-8 seeds 1″ deep in 1′ diameter hills, thinning to 3 or 4 plants at the set of true leaves. Or plant Organic Winter Squash Seeds in rows 1″ deep, 2′ apart. Keep rows and hills 6′ apart. Germination should occur in 5-10 days at 65-85°F. Keep soil just-damp during germination, or seeds may rot. Harvest when Organic Waltham Butternut rind has hardened and finger nail requires pressure to pierce rind. Leave 2-3″ stem on when cutting from plant for longer storage.